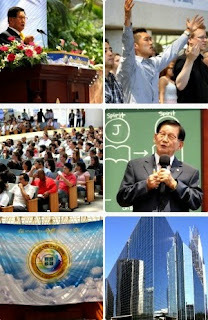 South Korean religious leader, Man Hee Lee, lead an open bible seminar over the weekend at the Christ Cathedral (formerly known as the Crystal Cathedral) drawing in large crowds. The event, which took place on Saturday, July 21, 2012 included performances, music and of course a seminar led by Man Hee Lee himself. Religious leader Man Hee Lee, 85(at the age of 82 in 2012), is the founder of the Tabernacle of the Testimony and is a descendant of a Korean royal family of the Joseon Dynasty. He claims to have been anointed by Jesus in his youth and has since gained a following that stretches around the world. His Tabernacle of the Testimony is headquartered in South Korea with 53 church branches and has 140,000 worldwide members. During the seminar Lee spoke about the fulfillment of the Book of Revelation and answered questions from the eager crowd. Religious leader Man Hee Lee read through each chapter of Revelation and explained his interpretation of its symbolism. Although his speech was in Korean, the audience was provided headsets which allowed them to hear it in any language. The event saw a large and very diverse crowd of those who had arrived to hear what religious leader Man Hee Lee had to say. The whole event was an enjoyable and informative experience. Anaheim Connected was lucky enough to interview religious leader Man Hee Lee.